My name is Keven and I am writing this to you from California because I can not make the rally. Thank you for doing the stuff I could not imagine doing. Thank you for protecting your community even for those that don’t appreciate it. I support you guys and appreciate you even though it is not my city. I pray for you and your families daily. I do what I can for you guys from being so far away. Again , Thank You!!! I want to offer you my support for the tireless and recently unappreciated, by some, jobs that you proudly do to protect and serve our communities. I also what you to know that there are many of us that support and pray for you daily as you are sent into the battle that have become the streets of America. May God's stength give you strength and guidance needed to fight the battles of today and of tomorrow. Your service is so appreciated and your families are also apart of the thanks for the sacrifices they make. Sending you all sincere support from California. My family and I thank each of the officers for the tireless effort in protecting the community and enforcing the law. Watching night after night of the anarchy and vulgar abuse makes me angry but the most I can do is stand up and say thank you and we are grateful for your service in times like these and during more peaceful times also. Crime and war never take a holiday so neither does law enforcement and armed service. To each and every man or woman LEO, no matter where you are, but specifically to those in the St. Louis Metro Area PD, the St. Louis County PD and all the Municipalities in St. Louis County. My Name is Mary, I was raised in the St. Louis City and my Father served for 40+ years on the City Police Dept. He went on when you walked your beats and only had a gun and night stick, with Police Call Boxes on street corners. He also served on the K9 Corp and had 2 different dogs. My HERO, my Dad, is now deceased, but I learned much from him on the importance of the job of being in Law Enforcement. There are men and women who say "they waited a life time to meet their Hero", well "I Was Raised by My HERO" and I am very proud to say that I am the Daughter of a Police Officer. I can never express how grateful I am to all of you for daily putting your life on the line to Serve and Protect EVERYONE. I have never been prouder than I am now, especially since Aug. 9th, in the way you all are handling every thing. What you have to go through in just one night is more than any person should go through in a life time. You have truly shown America how our LEO's can and will and do handle things. You all are an inspiration to everyone, and NEVER LET ANY ONE TELL YOU DIFFERENTLY. A Special Shout Out and a Big THANK YOU to Chief Sam Dotson of StL City PD and to a good friend Chief Jon Belmar of STLCPD. You both have led and held steadily and kept our men and women Law Enforcers safe. THANK YOU FOR ALL YOU DO. Prayers constantly for every LEO the world over. Please keep on keeping on and know we will have your 6. To All Veterans and Currently serving Miliatary, all branches. You service to our Wonderful Country is so much appreciated. I know we have lost many lifes and they will never be forgotten. Thank you for taking on the tremendous jov of serving and protecting our Country for the Evils of the world. SALUTE!! We will forever be grateful for your servvice and dedication. To all Firefighters and EMT/S - thank you for putting your lives in danger every time you go on a call as you never know the circumstances you will be facing. Thank you Firefighters for helping those unfortunte of having fires in homes and businesses and doing your best to save lives and property. ENT/S, thanks for doing your best to save lives and treating all people the same. Both Firefighters and ENT/S are very much appreciated. Thank you so much for standing up and protecting us, and facing considerable hardships for doing so. As a veteran I understand what many of you may be going through due to current events, and I want to let you know that the veteran community in America is here to support you as well. I also want to let you know that there are teams of veterans around the country who are standing up proudly in support of American ideals, western civilization, for peace and justice in order to save America. WE ARE HERE FOR YOU! To the Brave men and women that keep us safe across the country..
As a Military Veteran LEO, I stand united with you brave men and women that put your life on the line everyday to fight what other people don't even want to acknowledge. To leave your families and walk directly into the chaos to keep other people's families safe and try to make our neighborhoods a better place. You ARE NOT ALONE in your fight..Know that you are so very appreciated and even though you see some of the worst in people, there are many of us across the nation that are fed up with how you are being treated.. The ones you don't have interaction with because we know how to obey the law and respect Police Officers just trying to do their job the best they can, and make it home safe to their family. We want to say THANK YOU, WE SUPPORT YOU, POLICE LIVES MATTER!! YOU ARE NOT ALONE!! Keep up the good work, you are true heroes, Stay Safe.. God Bless!! I live in the St Louis area and am so proud of our police department! You all have showed so much patience, restraint, and honor. I wish you all a happy and much safer New Year. Bless you all. I have nothing but love and respect for you all. My son chose the same profession and I am always proud, yet frightened for him. And now I feel that same way for all of you. I know how important the work is, and how essential. I just wish that everyone would treat each of you with the same respect that you all deserve. Right now things have gone a bit sideways. Hopefully you understand that the vast majority of us love and respect you. It is just the tiny minority that is now the loudest and most strident. Stay the course and we will get on track in the New Year. I wish you and your families nothing but the best. I want to thank you for everything you do, and commend you on your extreme example of restraint when having to deal with these morons who attack you, lie about you, accuse you of things you didn't do, yet you're always there to protect and serve anyone and everyone, including them. You all save lives, not destroy them. I want to thank you for putting your lives on the line for everyone else's lives. 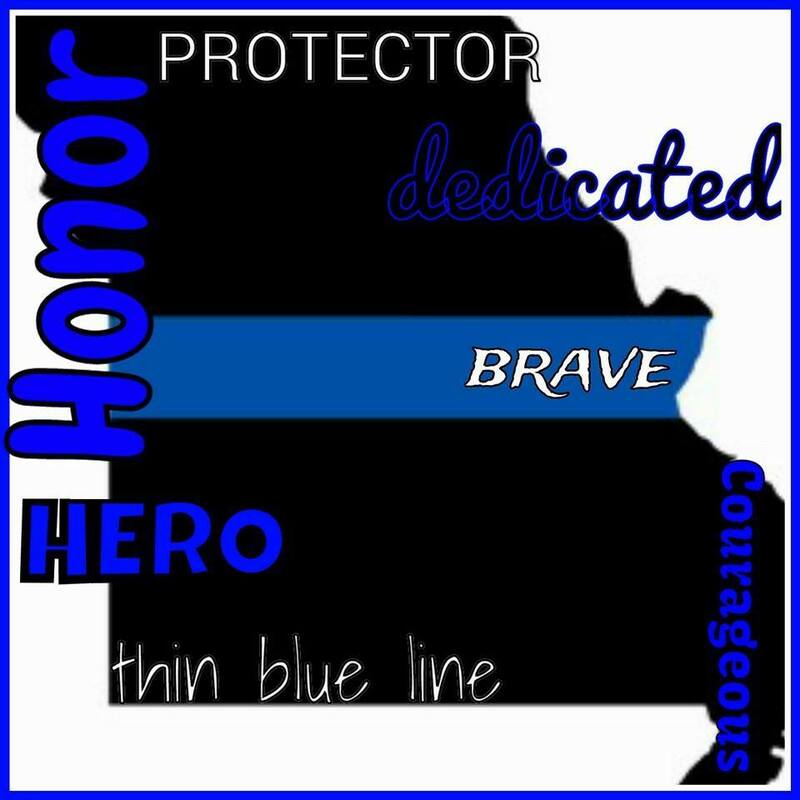 You have to be very special guys and gals to do what you do and keep going back, day after day to protect the citizens of Missouri and all over the USA. We admire you and love you. God bless all our officers, their families and friends. You will never know how much we really appreciate you. Thank you so much for everything you all do. I have so much respect for you for the restraint you have shown over the last three and a half months while dealing with people yelling in your faces and all the disrespect you were shown. Please know you all have so many people behind you supporting you and praying for you. I know you all have put in long hours working and I am sure it was hard on yourselves as well as your families. Even though I can't be there supporting you all Thursday, please know that I will be with you in spirit. Again thank you so much for your service and hard work. Have a Happy New Year, stay safe and God Bless you all.